Karyotypes were compared in 48 species, including 6 subspecies, of birds from 12 orders: Casuariiformes, Rheiformes, Sphenisciformes, Pelecaniformes, Ciconiiformes, Anseriformes, Phoenicopteriformes, Gruiformes, Galliformes, Columbiformes, Falconiformes and Strigiformes. — With the exception of the family Accipitridae, all the species studied are characterized by typical bird karyotypes with several pairs of macrochromosomes and a number of microchromosomes, though the boundary between the two is not necessarily sharp. The comparative study of complements revealed that a karyotype with 3 morphologically distinct pairs of chromosomes is frequently encountered in all orders except the Strigiformes. Those 3 pairs, submetacentric nos. 1 and 2, and a subtelocentric or telocentric no. 3, are not only morphologically alike but also have conspicuous homology revealed by the G-banding patterns. Furthermore, G-banding analysis provided evidence for the derivation of the owl karyotype from a typical bird karyotype.—The above cytogenetic features led to the assumption that the 3 pairs of marker chromosomes had been incorporated into an ancestral bird karyotype. It seems probable that those chromosomes have been transmitted without much structural changes from a common ancestor of birds and turtles, since the presence of the same marker chromosomes in the fresh water turtle Geoclemys reevesii is ascertained by G-banding patterns. — A profile of a primitive bird karyotype emerged through the present findings. 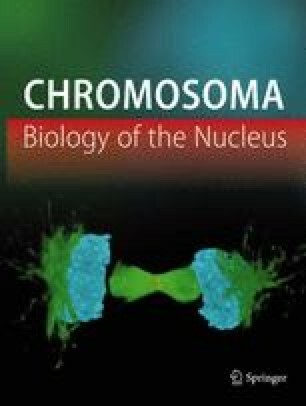 Hence, it has become possible to elucidate mechanisms involved in certain structural changes of macrochromosomes observed in birds. It was concluded that a major role had been played by centric fission as well as fusion, translocation, and pericentric inversion.